In Part II of the Inner Strength teacher training you will develop the understanding and ability to teach students to see their experience in a larger context. — Give simple and graspable explanations for how teens can take more responsibility for themselves by understanding the neurological triggers that have developed over 300 million years. — Guide students back into a simpler time in history, enabling them to appreciate the advances they benefit from and reduce the insecurity they feel in relationship to the complexity of modern culture. — Integrate these tools with the practice of mindful exercises. Registration for Part II includes a copy of the 100+ page Mindfulness & Cultural Development Teacher’s Manual. This manual includes detailed lesson plans, additional resources for teachers, and teaching tools for the classroom. Part II includes an in-person training retreat August 2-4 in the Philadelphia area. 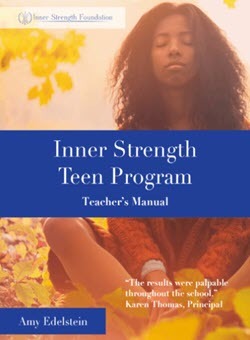 Successful completion of both Part I and II (mindfulness and the developmental perspective) is required to receive your Inner Strength System Teacher’s Certificate of Training. Inner Strength Teacher Training Part I and II: Full details and registration available here.